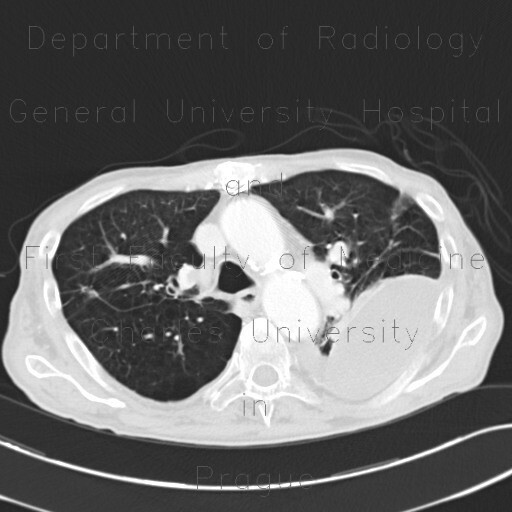 First plain chest radiograph shows large oval area of decreased transparency in the left upper to middle lung field and partial collapse of the left lower lung lobe indicated by its decreased transparency and a small pneumothorax seen in the left lateral costodiaphragmatic angle. Second plain chest radiograph shows that pneumothorax resolved after insertion of a chest tube. Chest CT confirmed left-sided ventral pneumothorax, loculated pleural fluid in the left hemithorax that was mimicking a mass on chest radiograph and also bilateral free pleural fluid, decreased ventilation of the left lower lung lobe, centrilobular emphysema, and a large calcified and thrombosed apical aneurysm of the left ventricle.